Many people are fond of travelling. However, the job they do, leave them twiddling their fingers wondering when they will get an opportunity to travel to places around the world. Just vacation wandering doesn’t satisfy you, you should be searching for a job that will satisfy this need of yours. There are plenty of employers out there who seek employees who would love to pack up and fly whenever a need arises for their company. You just don’t have to think about the oh-so-obvious jobs like in travel industry but there are various other jobs for people who love to travel. 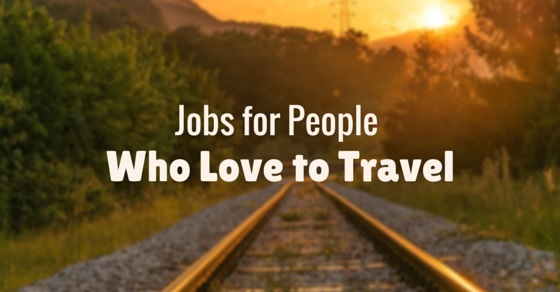 Listed down are jobs that require travel and that a travelling enthusiast can go for. The following mentioned are few jobs that involve travel and the travel careers or jobs for people who love to travel. If you have the adequate training and qualification for being a nurse and if you are not interested in joining in the local hospitals for the same responsibilities and people every day you face, you can become a travel nurse. Doing so you will get the opportunity to travel around the country and departing from one hospital engagement to another and working across the cities. As a travel nurse, when you assist for a company they will provide for your accommodations and travel expense. If you are a music fan you can become a roadie and you will travel to places with a band of musicians to maintain and arrange the equipment. You will have to handle the lighting and sound equipments, instruments and moving heavy objects to set up the stage etc. You can start up with small theatre and venues. Once you are well trained with the arrangements you can even tour with major musicians. Another best option for travel freaks are becoming tour guide. Mostly, the places that attract tourists need tour guides. If you bloom as a tour guide you can eventually end up owning tours and travel company. You need to be well qualified with historical knowledge and culture of places as well as develop communication skills by learning different languages. If you like helping other people who are in depths of a crisis, you can become an international aid worker. You need to have qualification in the relevant area of what you expect to help as. Countries that are affected by economic crisis, natural disasters, famine or war etc are countries where international aid workers help. With the gratification of helping people in these countries, this job title also receives pay well up to six figures. Archaeologists are scientists who unearth artefacts and remains for human history. If you are a trained one you can travel many niche places to hunt for human remains and development of human history. One can also protect such works of art that reveal history, from construction groups other than excavating relics. There are many places on earth that have invaluable human relics under the layers of earth, so the scope of travelling is always great in this title. English has become a language spoken by most of the people and a universal language to connect and communicate with people from different countries to bridge the gap among countries that plan to collaborate for trade and peacekeeping purposes. Many people in the non- English speaking countries desire to learn the language. There are companies that place teachers internationally. Travelling places on a yacht is another great opening to hit. The yachts need captains, deckhands, engineers and chefs etc to maintain the yacht and satisfy the tenants. The pay is very high and there are chances of meeting celebrity personalities of various fields like business, entertainment or politics. Being an assistant to corporate executive means, travelling along with them for business trips. It may not be an alluring job. However as these executives travel frequently for business and client meetings and as you are an assistant to them, you get many occasions to catch sight of new places. This job is most accessible as it doesn’t require one to have a specialised degree but training and customer service experience. The work hours may be unpredictable and the tasks will be difficult however you surely will get to visit many cities around the world. You will have to attend retailer conferences, trade shows and meetings across the country or globe to spot consumer and industry trends and make deliberations on what the company should sell. Many large retail companies hire buyers to assist selection and negotiation of goods deals. If you are good with kids and handling their concerns plus you know a second language, becoming a nanny or au pair is a good option. No high payments sometimes but you will get to live with the family in a foreign country and assist them with their childcare and babysitting concerns. You get to fully immerse in a totally different culture and place. You can become event organisers for large-scale events like festivals and business shows. You will deal with potential trade and travel to event venues and assist in managing the events. As you incline as an event organizer you get many opportunities to travel places hunting best event venues and manage events across the globe. Couples who choose a destination wedding will need photographers who are willing and love travel. With the photography skills you will get to see a new place capturing the stills for the newlyweds and fulfilling your travel desires. Many websites and magazines that have travel as their core subject need candid and never seen before pictures of places. They need pictures of each and every city and alluring destinations across the globe, so you will have the opportunity to travel to a new place for every edition or addition of the magazine or website respectively and for your collection. It is difficult to make a living with this job but you will definitely have fun. There are full time travel writer jobs available however you will mostly come around freelance jobs. Most of the publications want the direct report of the location you are currently writing about. You can work as a hotel manager especially at resorts where you can spend time around the vacation spots. You must have requisite training as well as experience. Most of the chief hotel chains have requirements for relocation. You can study and get a degree in international relations and find a job with the government in foreign trade and affairs. These positions will open a wide range of travel occasions but remember you can be positioned at any unpredictable place without you being enlightened. Nevertheless if you are very enthusiastic and love taking challenges you will surely fit in. You can travel to a different country and teach yoga or dance or give coaching in any other talents. You can travel and learn more dance forms, at the same time enter into another country and teach your previously learned dance forms. This is one way of making travel and tourism job, at the same time practicing your talents as a career. If you have a singing talent, there are many bars and taverns where you can sing along an orchestra. You will find many bars across the world and you can work in different locations every time you sing for a bar. As you have wanderlust this opportunity can be used to the fullest and you can discover many locations around the globe. You can become a web developer with adequate skills and learning. As we are living in a digital era many countries internationally want people with extra talent along the basic knowledge of web designing. You can travel to another country and work as a website designer there, if you think you have that potential. As a consultant, you get to solve problems of many companies across the country and maybe even internationally. From management to marketing, you can consult and give advice for any matter. You can be tied with many companies over the time however this relation can last for a short or long period of time. As a reporter, you get the opportunity to travel to new places for reporting from that location. You could choose to go overseas for a foreign branch of the news media company that is in your country. You need to have enough skills and experience as well as good command over more than two languages. As a parachute reporter, you can stay in your own country but you will be flying to other countries to report news events occurring in that particular country. If you educate and have experience as an auditor you get chances of being sent to distinct locations. You may not get the most exotic locations however you will be spending few weeks giving you time to hang around the new place. Many companies and professional organisations hire recruiters to hunt for talents across the country from various colleges and universities. During seasons you are bound to travel very frequently and intensively on the other hand off season you may spend most of the time in your office. As travel being the base interest you can join in any of the above streams of a job for a living. With adequate skills and possession of knowledge and with training, you can choose jobs with travel and career above that will allow you to frequently travel and breathe around various parts of the world. Don’t just let travelling remain a dream and go for jobs that keep your passions alive!